Looking back, the conference was an intense experience with many remarkable moments, including stunning nature and rides along the endlessly straight and dusty roads of Patagonia. Meeting all the people from all around the planet was an incredible feeling, almost like meeting your family again after two years, since our last conference in Athens. Most of us came a long way in these two years and many enthusiastic stories were told once we met. The actual event started for most of us with a flight from Buenos Aires to Neuquen, and a bus trip through the desert to Cutral-Co, a remote town in northern Patagonia. Mostly oil pumps is what you see here when checking out the area, although the potential for wind power is huge. The next day, after breakfast and a kick-off ceremony with several Argentine politicians speaking at the municipality building, we drove to the conference venue, the Parque Tecnologico in Cutral-Co.
We quickly found out that everything was organized nicely and on a high level by our local partners: the municipality of Cutral-Co and INTI. There were also two other conferences about renewable energy going on at the same time. The Cyted forum and a fair of renewable energy manufacturers. The conference was organized around the working group sessions. These sessions took place all following the same scheme: First, results of the working group’s activities were presented to the crowd, then the WG’s coordinator asked a few related questions and we made smaller groups to discuss them. In the end, each small group presented their results. All that while sipping finest Argentine mate and, most importantly, refilling it before handing it over to the next person! In each session, innovative projects and ideas as well as research results around the field of locally built small wind systems were presented and a lot of useful feedback was given by the crowd. Compared to our last conference in 2014, there were now some results to be shown since the working groups have been quite productive. From open source electronics and maintenance surveys to market assessment reports and delivery model studies – there was a lot of progress! During the time in Cutral-Co, we got a guided tour through INTI’s facilities and presented our posters at a fair of small wind and renewable energy companies. We finished in Cutral-Co with our Annual General Meeting (AGM). We discussed important topics for the association and most importantly, we elected a new executive board. Thursday morning, we went to Bariloche to the venue where the last two days of the conference took place. On a bus through lonely desert landscape that slowly transformed. First small hills showed up on the roadside and then we trove through canyons and passed beautiful lakes. We soon realized that Patagonia has a lot to show off! 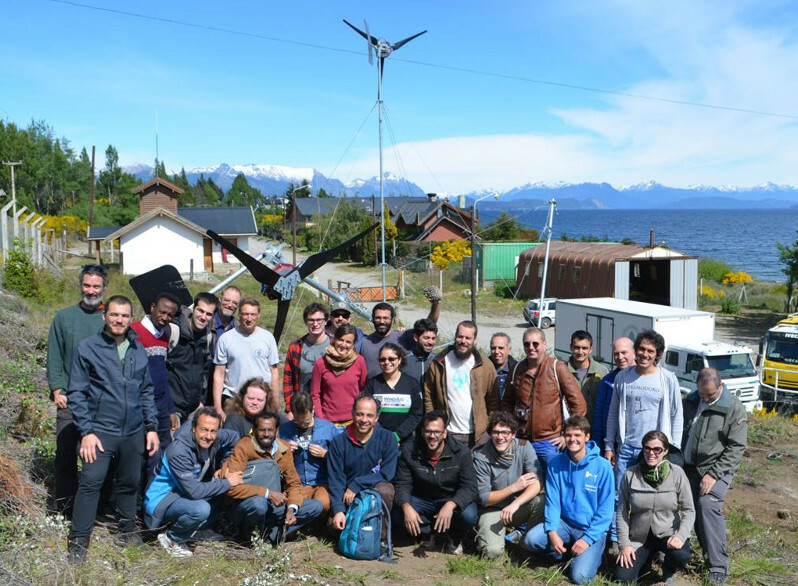 In Bariloche, the conference was hosted by APN, the national park administration of Argentina. Our venue was the Don Bosco school. The main actions on the last two days were working group sessions. We stayed in the administration building of the Nauhel Huapi National Park which was right next to the huge lake. The next morning we took down one of the small wind turbines installed at the Parques Nationales site where we were staying, to check out some construction details. It was a Piggott machine but made by the streamlined manufacturing process by Eolocal. Written by conference attendee Jonathan Schreiber from PureSelfMade.